Almost all older people will remember the Co-op Dividend: ask anyone over 60 and they can usually remember their – or their parents’ – “Divi” number. In the days before loyalty cards and electronic funds transfer, this was a primitive way of getting some money back on what you spent : you shared in the profits. Less well known are the Co-op tokens. These were metal, or later plastic, coins that you could buy at the Co-op ; you then used them to buy milk (often they were left on the doorstep with the empties) or sometimes bread from the Co-op milkman. In some places they were used to buy coal too. 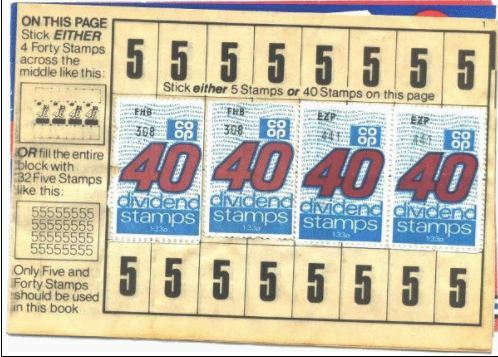 The advantage was that you got your “divi” on them when you bought them in the shop : if you just paid the milkman in cash, you didn’t get any dividend. In some areas, a different system was used . In Wakefield, for instance, the tokens were handed to customers in the shop according to how much they spent. Once they had collected a lot of lower value tokens, they could exchange them for higher value ones. At the end of the year, when the dividend rate was declared, they would present the tokens as proof of how much they had spent and claim the percentage dividend back. This replaced the earliest system (dating from 1860 in the case of Ripley) where the customer gave the shop assistant their divi number which was written in a ledger with the amount they spent. The customer was given a “check”, a slip of paper with the amount spent recorded on it. One family remembered keeping the checks on a piece of wire in their larder, ready for the great day when the “divi” was declared. From 1910 Ripley adopted the Climax Check system, and were processing 30000 checks a week. Many are the tales of children sent to buy a bag of sugar who forgot to give the divi number or lost the check on the way home, and suffered the consequences ! In the 1960s stamps were used instead of tokens ; the customer stuck them in a book and exchanged the book for cash or goods at the end of the year. 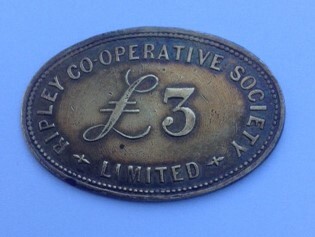 Each Co-op produced their own tokens : they were usually thin metal discs stamped on one side with their value and the name of the issuing Co-op. Ripley, being one of the biggest Co-ops in the area, issued thousands between roughly 1920 and 1960. The lowest value token was a halfpenny , which was an unusual six-sided token : the highest we’ve seen is a rather splendid £3 token, a brass oval shape. Nowadays, in a strange twist, the tokens have become collectible items : you can buy and sell them on e-bay. Welcome to the Ripley and District Heritage Trust, Derbyshire, UK. Our aim is to collect and conserve documents and artefacts relating to the history of Ripley and district. Our website is (always) under development and we hope to add more pages soon. We now have online ordering of publications : please let us know if there are any problems with it.